This is the Stellarvue 80 mm f-6 apo triplet made using our deluxe 2.5" dual speed, rack and pinion focuser. It uses the sharpest and highest contrast 80 mm apochromatic triplet lens we have ever offered. The focuser is threaded for photographic field flatteners sold below and has 1 1/4” and 2” compression ring visual adapters. This telescope also comes with heavy duty dual rings and a C19 heavy duty travel case. This is not a mass-produced scope using inferior glass and sloppy mechanics. This is a truly premier 80mm apo. It is well known that the Stellarvue 80 mm triplet is one of the highest rated 80 mm telescopes on the market. With that being said, we have taken the optical accuracy even higher in this new SVX series! These are the telescopes to buy if you wish to view the universe both visually and photographically. SVX series Apochromatic Telescopes use objectives that have the highest optical ratings as measured and documented on our Zygo Phase-Shifting Laser Interferometer. SVX series optics are rated at .98 - .996 Strehl with excellent optical correction for aberrations commonly seen in mass produced optics. To attain this level of optical accuracy it is usually necessary for us to go beyond machine polishing. Special tools are made and experienced opticians hand figure objectives here in our optical shop in Auburn California. While our former models (without the X designation) were all excellent coming in at .95 Strehl or higher, SVX series telescopes are even more exceptional, placing 98 - 99% of the light precisely where it should be. Stellarvue Premier (X) Series refractors are for the astronomer who recognizes the best when they see it. Each SVX series refractor comes with a Zygo interferometric test report taken in our shop, documenting the accuracy of your objective! The Stellarvue SVX80ST-25SV features an 80 mm f-6 (480 mm focal length) fully multi-coated, 3 element objective lens with an Ohara FPL-53 center element. Fully multicoated apo triplet objective: The high Strehl, apochromatic triplet objective has optical accuracy far above our former Russian made lenses. 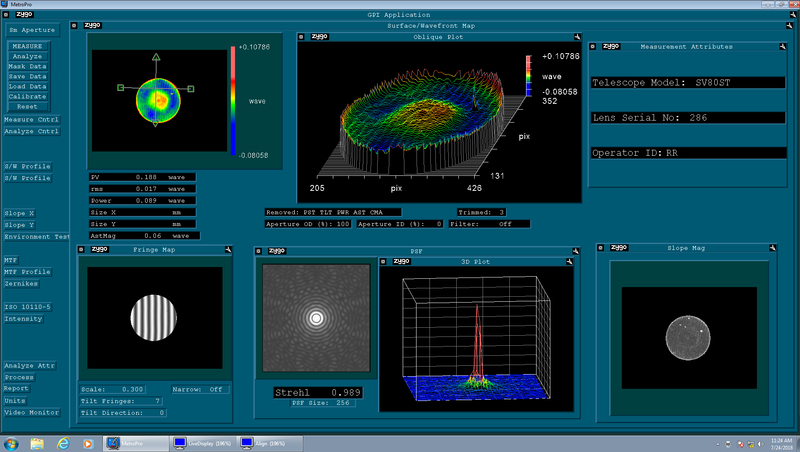 We are now taking the time to provide interferometric test reports with each of our triplet refractors showing how the lens in your telescope actually performs. These lenses are far above the .95 Strehl standard and it means your telescope will perform perfectly. Tube and dew shield: The standard model (SVX080ST-25SV) comes with an aluminum tube and dew shield that is finished in Instrument White. Fittings are black anodized aluminum. The dew shield retracts reducing the length of the telescope when being stored. Extending the dew-shield minimizes dewing of the objective at night and serves as a glare shade during the daytime. Internal tube treatment: The inside of the main tube assembly is painted "ultra flat black" and is baffled to eliminate tube wall reflections. Difference between aluminum and carbon fiber tubes: The aluminum tube of the SVX80ST cools down rapidly and is nearly the same weight as composite tubes. We feel that aluminum is is the best material for this particular telescope as it cools down rapidly and allows for perfect alignment through precise CNC machining. 2.5" Stellarvue visual/photographic focuser: This focuser provides a full 3.2" of travel. This focuser is perfect for visual use as well as imaging with certain limitations. The rear of the draw tube is threaded to accept our dedicated SFF6-25 photographic field flattener (for cameras with APS size sensor). The SFF3-80 allows the user to shoot with full frame although the 2.5" focuser will vignet a little. If you plan to shoot at full frame and you want to use a full frame reducer this telescope is not the best choice. We recommend our visual-photographic SVX80T-3SV if you want to do this. The 3' focuser on the 3SV version will acceot the large .74X reducer whereas this telescope cannot. So if you are interested in imaging at f-6 AND f-4.5 choose the SVX80T-3SV. The 2.5" Stellarvue focuser on this model is a heavy-duty rack and pinion unit designed to carry a higher capacity. It has an ultra-smooth (7:1 Ratio) fine focus control to attain perfect focus every time. An internal brake system allows the user to adjust capacity. The focuser is fully rotating with a wide groove for smooth and precise rotation. All of the features add up to one of the finest dual speed focusers available today. If you prefer the Feather Touch focuser, it can be ordered using the "Replace Stellarvue focuser with 2.5" Feather Touch focuser" option above. The vast majority of our customers use the Stellarvue focuser which is considered to be second to none. Aluminum hinged rings: The SV80ST comes with two-hinged, American-made, cnc-machined aluminum mounting rings. Each ring has five screws top and bottom. Threaded holes are 1/4-20. There is one center hole, two holes spaced 1.5" apart and two holes spaced 60 mm apart. Use the optional TP14 rail for telescope mounts using the Vixen style rail or use the optional TP6 for mounts that use the larger Losmandy style rail. Case: The SV080ST comes with a thickly padded, C20 airline carry-on case. Outside dimensions: 22" x 9.5" X 7.5". Inside dimensions: 19.5" X 6" X 5". Light gathering and magnification power: An 80 mm refractor gathers 131 times the amount of light the naked eye does. Although Dawes limit states maximum power for telescopes under good conditions is about 189 power for an 80 mm telescope, you can exceed this power on a steady night. This is a true apo triplet capable of high power when conditions permit. Check the Recommended Accessories section to make the best choice for eyepieces. Two year warranty and Stellarvue Service: We are with you for life. Stellarvue telescopes and accessories are covered by a two year warranty. But it does not stop there. Since we are a telescope maker, we can repair your telescope for a very nominal fee years after it goes out of warranty, should you accidentally drop it on concrete or otherwise damage it. Buy a Stellarvue Telescope with confidence. Our customer care is legendary. To take astro-photos you will need a photographic field flattener designed for this telescope. Just click the option for the 2" Dielectric Star Diagonal button above to the right of the telescope's picture. High Power Eyepiece for Planets, double stars and close views of the moon. We recommend either the EP 04.9, the EUW 04.0 or the EOP 03.6. Get the one with the widest field of view you can afford. Medium Power Eyepiece for deep sky objects including galaxies, star clusters and nebulae. We recommend the EUW 08.0 or the EOP 09.0. Get the one with the widest field of view you can afford. Low Power, Wide Field Eyepiece for larger extended objects, loosing yourself in the star fields of the Milky Way, etc. We recommend one of two options. If you are using a go-to computerized telescope mount the E7026R can serve a dual purpose. This eyepiece provides a wide 70 degree field of view and it has a crosshair reticle built in. This reticle will assist you in centering the three stars when you set up your telescope to operate in go-to mode. You can optionally purchase an illuminator for the eyepiece to make it easy to see the crosshair. Since this eyepiece is economical and has the crosshair, many of our customers like using it. For better overall correction and the widest field of view get the EOP 20.0. Easy to use alt-azimuth mount. Use this with a heavy duty camera tripod such as Manfrotto 475. Please note: each camera (and even each t-ring) has different spacing. We want to make this as easy as possible for you so please call us at (530) 823-7796 if you have any questions and we will assist you in getting the correct parts in order to attain the best images. The main tube is 90 mm in diameter. The complete telescope is 18 3/4” long with dew shield extended and 16” long when retracted. The optical tube assembly weighs about 5.8 lbs. The dual rings weigh about 1.2 pounds total. 2.5" dual speed Stellarvue rack and pinion focuser with 2" and 1.25" compression ring adapters. May be used with SFF3 flattener but not with the SFFR-74X reducer. Optional. We carry the F001 red dot finder and the F002 multi reticle finder. Optional. We carry the TP14 rail for telescope mounts using the Vixen style rail or use the optional TP6 for mounts that use the larger Losmandy style rail. Stellarvue R90SET precision hinged rings. Each ring has five 1/4-20 holes top and bottom with one in the center and two spaced 1.5” and 60mm apart. The SV080ST comes with a thickly padded, C20 airline carry-on case. Outside dimensions: 22" x 9.5" X 7.5". Inside dimensions: 19.5" X 6" X 5". STELLARVUE LIMITED WARRANTY FOR U.S.A. AND CANADA END PURCHASERS ONLY Stellarvue (SV) warrants that each SV brand telescope and accessory shall be free from defects in materials and workmanship for two years from the date of purchase. SV will repair or replace such product or part thereof, which upon inspection by SV is found defective in materials or workmanship. As a condition to the obligation of SV to repair or replace such product, the product must be returned to SV as specified in this warranty. THIS LIMITED WARRANTY, AND ANY IMPLIED WARRANTIES THAT MAY EXIST UNDER STATE LAW APPLY ONLY TO THE ORIGINAL PURCHASER AND LASTS ONLY AS LONG AS THE PURCHASER OWNS THE PRODUCT. Warranty and repair return requirements: • Proof of purchase acceptable to SV must accompany any return for warranty work. • A return Authorization must be obtained from SV in advance of return. E-mail Stellarvue at mail@stellarvue.com or call (530) 823-7796 to receive the authorization & packing instructions. • The authorization code must be written on the outside of the container. • All returns must be accompanied by a written note stating the model number of the product, authorization code, name, address, e-mail address and daytime telephone number of the owner, and an explanation of the problem. Replaced parts shall become the property of SV. • The customer shall be responsible for all costs of transportation and insurance, both to and from SV. SV Requirements • SV shall use reasonable efforts to repair or replace any product covered by this limited warranty within thirty days of acceptance. If repair will take longer, SV shall notify the customer. • SV may replace any product that has been discontinued with a new product of comparable value and function. Products that have been damaged, dropped, disassembled, abused, misused, mishandled, subjected to temperature or weather extremes, subjected to unusual wear or modified in any way will not be covered by this warranty. In these instances, this warranty shall be null and void. THESE WARRANTIES REPLACE ALL OTHER WARRANTIES EXPRESSED OR IMPLIED INCLUDING, BUT NOT LIMITED TO THE IMPLIED WARRANTIES OF MERCHANTABILITY AND FITNESS FOR A PARTICULAR PURPOSE. SV MAKES NO EXPRESS WARRANTIES BEYOND THOSE STATED HERE AND DISCLAIMS ALL OTHER WARRANTIES, EXPRESSED OR IMPLIED, INCLUDING, WITHOUT LIMITATION, IMPLIED WARRANTIES OF MERCHANTABILITY, AND FITNESS FOR A PARTICULAR PURPOSE. THE SOLE OBLIGATION OF SV UNDER THIS LIMITED WARRANTY SHALL BE TO REPAIR OR REPLACE THE COVERED PRODUCT, IN ACCORDANCE WITH THE TERMS SET FORTH HEREIN. SV DISCLAIMS ANY LOST PROFITS, GENERAL, SPECIAL, INDIRECT OR CONSEQUENTIAL DAMAGES WHICH MAY RESULT FROM BREACH OF ANY WARRANTY, OR ARISING OUT OF THE USE OR INABILITY TO USE ANY SV PRODUCT FOR ANY PARTICULAR PURPOSE. THIS WARRANTY GIVES YOU SPECIFIC LEGAL RIGHTS AND YOU MAY ALSO HAVE OTHER RIGHTS THAT VARY FROM JURISDICTION TO JURISDICTION. WARNING: LOOKING AT THE SUN CAN CAUSE SERIOUS EYE INJURY AND BLINDNESS. NEVER POINT A TELESCOPE AT OR NEAR THE SUN. VIEWING THE SUN WITHOUT A PROPER SOLAR FILTER MAY RESULT IN BLINDNESS, AS WELL AS DAMAGE TO THE INSTRUMENT. NEVER ALLOW CHILDREN TO USE BINOCULARS OR TELESCOPES DURING THE DAYLIGHT HOURS, UNLESS THEY ARE SUPERVISED BY AN ADULT WHO UNDERSTANDS THE DANGER OF POINTING ANY OPTICAL INSTRUMENT IN THE GENERAL DIRECTION OF THE SUN. This refractor has it all: great optics, solidly built, and well designed. It is also light in weight, making it a great grab-n-go scope. It took me no time at all to start taking captures with my CCD camera of the galaxies and nebulae. This scope has an incredible field of view and the deep space objects were stunning looking both visually and with the camera. Features like the built-in dew shield and micro-focus knob makes this scope a pleasure to use. I do not think you need an optical finder scope for this refractor but using a reflex finder can be helpful. So far, I have also been very impressed with the customer service provided by Stellarvue. Overall, I could not have made a better choice. I spent almost a year going back and forth over this scope and many others. I decided to finally pull the trigger. I couldn't be happier with my choice. Upon opening the well done packaging I found the scope just plain feels good. Everything works smooth, the fit and finish is spot on. After waiting 3 days for the clouds to lift, I was amazed by the views. I highly recommend that you don't wait as long as I did. When I received my scope and opened the box I was very impressed by the level of quality and performance of my SV80ST. The scope was very solidly built and came with a threaded cap for the hood. The included case was good quality and fit everything I wanted to out in it and more. The performance also was spot on. Excellent value.